In the past, glass jar blenders were the industry standard, but over the years many manufacturers have transitioned to using plastic containers. The main reason for this switch to high strength plastic is due to the increased power and speed that modern blenders operate at. Why Does Vitamix use Plastic Containers ? SIDE NOTE – If you really want a non-plastic jar for Vitamix, look at this stainless steel jar from Waring that will fit onto Vitamix blenders. Talk to Vitamix first about how using a non-Vitamix jar would affect Vitamix’s warranty. The advantages of glass pitchers are scratch resistance, clear transparency, and they do not absorb food odors. They also do not contain BPA compounds which are found in some plastic products. BPA is said to pose some health risks, although the FDA continues to say BPA is not hazardous. Most blender companies including Vitamix, Blendtec, and Ninja use a BPA-free high-impact plastic called Eastman Tritan. For more on the BPA free debate you can read this article and this study. Since you are here, I assume you have already decided on buying a glass, BPA free blender. Most blenders come with a number of speeds and preset programs to allow for ease of use and better performance. The preset programs are a nice feature to have for hands-off use and for achieving a consistent blending result. A good blender should be priced adequately and backed by a reputable blender manufacturer. Poorly made blenders can overheat and have a short lifetime so you want to find reputable brands that provide a good balance of performance and price. 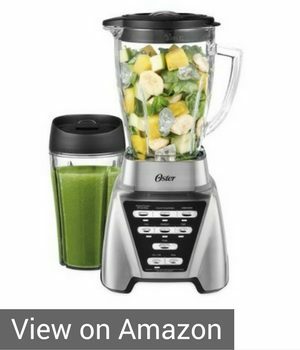 This blender operates at a peak of 1200 watts (1.6 horsepower) and is the most powerful of the glass jar blenders on this list. The reviews are very good with frequent user comments stating that it is ‘able to smoothly blend all ingredients’. Consumer Reports said the Oster Pro 1200 tested very good in overall performance. It comes with 6-cup silicate glass pitcher that is both temperature and stress resistant. It also included a 24oz smoothie blending jar. It features seven controls that include; three-speed modes(low, medium and high), pulsing mode, and preset programs for smoothies, chopping, and milkshakes. The Oster Pro 1200 has a reversing blade action so you do not need to stop and turn the ingredients. It performs well with heavier tasks like crushing ice and making green smoothies. Customers reviews say this blender is easy to move around the kitchen and can easily fit into kitchen cabinets. Positives: The Oster Pro 1200 has good power for a glass jar blender. It provides nice features for the money and is well built with a good warranty. It provides useful preset speeds for ease of use and rates well among consumers. Negatives: Despite its high power, it cannot mill flour or prepare nut butter as well as a high-powered blender but it does pretty well with a little help. A small negative is that it is heavy. Overall Opinion: The Oster Pro 1200 is the top pick among glass jar blenders and is a bestseller on Amazon. It provides good performance for the price as well as nice features. The silicate resistant glass and all metal blade assembly are well built. It provides a solid 3-year warranty for blender parts and 10-year warranty for the motor and metal drive shaft. The Hamilton Beach Power Elite was our top budget blender pick for best blender under $50. I ranked it #2 on this list because it is a little weaker in performance than the above blender, but is an excellent choice if you want a cheap glass jar blender for basic blending. The Power elite blender has a 700-watt motor and 40oz heat and shock resistant glass container. It uses Hamilton Beach’s “Wave Action System” and performs well for making smoothies, crushing ice, and simple blending tasks. Positives: Hamilton Beach Power Elite 58148A blender is a nice blender for the price and includes a solid 3-year warranty. 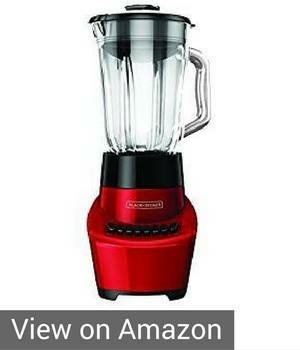 It has 1000’s of reviews and the user feedback is very positive about the performance of this blender. Negatives: It doesn’t do well at pureeing difficult ingredients like hard vegetables. Not intended for difficult blending jobs like blending hard raw vegetables, grinding flour, and making nut butter. Overall Opinion: Best value for glass blenders.The Hamilton Beach 58148A is the best performing model among the other comparable Hamilton Beach blenders. It is a solid blender for general blending needs and might take a little more blending time for more difficult tasks. Overall, a good blender for the price. It should last as long as you use it properly. Consumer Reports rated it “Fair in Overall performance” and there are extensive reviews confirming that this blender performs well for the price. The Oster Reverse Crush Counterforms BVCB07-Z00-000 blender has been around since 2007 and provides a nice balance of performance for the price. It uses a Boroclass heat and stress-resistant glass pitcher with six cup capacity. It provides 1000 watt of peak power with 600 blending watts for continuous blending or crushing ice. Just like the Oster Pro 1200, it also has reverse blade action technology to move ingredients around for more consistent blending. This feature is built into the controls so you do not have to flip a switch to reverse the blades. It has seven-speed settings. Apart from the glass pitcher, the rest of its body is made of stainless steel which gives it a nice look. Its stainless steel 6-point blade can handle heavy duty tasks such as crushing ice, making salsa or chopping vegetables. The smart setting programming is one feature that has been described as “amazing” by customers who have used it. With this feature, you just press a button and it will do whatever blending task that you have commanded it to do without any further interference from you. Positives: The glass pitcher is shatterproof. The reverse blade action control is a great feature. It is priced very competitively. Negatives: The downside to the Oster Counterforms blender is it is more limited in its blending capability. It will do fine for most smoothies, milkshakes, making salsa, and basic blending tasks but it can’t handle heavy duty blending and horsepower-intensive tasks like soups, milling flour and making nut butter. It also does not come with a tamper so you will have to stop and stir some ingredients. Overall Opinion: The Oster Reverse Crush Counterforms blender offers nice features for the price especially if you want a glass pitcher. For only a tiny bit more money I would go with the Oster Pro 1200 which has more power and a sturdier feel. The low-priced Black and Decker BL1110RG sells very well and comes with a 6 cup(48oz) glass jar and 550 watts of power. The fusion blade is stainless steel and the blender provides six preset speed functions with speeds of one to three. Positives: It does not take up a lot of counter space and is reasonably priced. It seems to perform OK for the price but not as well as the similarly-priced Hamilton Beach glass blender listed above. 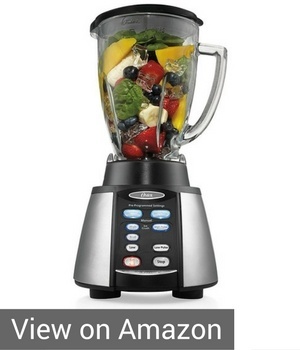 Negatives: Although this blender continues to sell well, the reviews were mixed on its blending ability. Overall Opinion: The Black and Decker Fusion Blade is my last choice among the best glass blenders. I included it because of price and popularity. A lot of people are familiar with the Black and Decker brand, but there are better choices for performance and price than this model. I would go with the Oster Pro 1200 or more basic Hamilton Beach Power Elite 58148A. 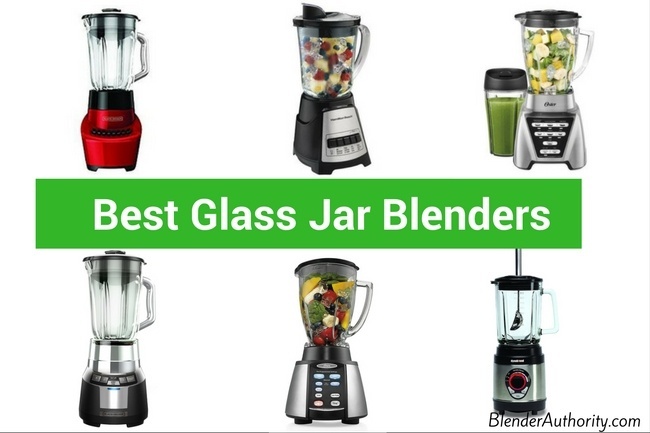 As already mentioned, there are not a lot of choices for Glass Jar Blenders, but there are a few more that didn’t quite make our list for various reasons. They might be worth considering depending on budget and preference so I will briefly mention them below. The Braun Puremix JB7350 glass jar blender is quite powerful with 1000 watts and is new in 2018 so we are waiting to see how it holds up over time before adding it to our list of top blenders above. We do like that it has a sturdy feel and is built with metal gears which helps for longevity when you are blending with a 1000 watt motor. Overall, it blends well and has a simple, sleek look. Waring is a well-known blender brand that has been around a long time and is known for using glass pitchers. The Waring Professional Kitchen WPB05 blender is their best selling glass blender but I didn’t include it because the reviews are mixed on how well it blends. 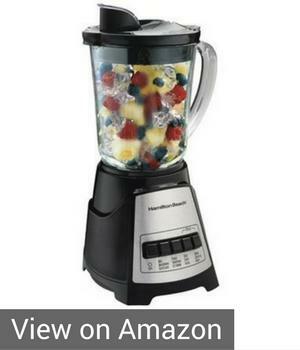 Consumer Reports said it only did “fair” in its test of the blender. Some people love the quality and simple controls of Waring blenders, but their glass models seem underpowered (350 watts) relative to competing brands. The KitchenAid 5-Speed KSB565 is the first offering by Kitchenaid with a glass jar and was introduced in 2011. It has 740 watts of power and is marketed as a commercial quality premium blender with a 48 oz. glass capacity pitcher blender. It has other nice features but there are a couple design issues that users have complained about which is why I didn’t include it in the list of best glass blenders. The design flaws are complaints about are the jar design makes it hard to clean and that the blade assembly leaks. The Electrolux Expressionist ELJB56B8PS was recently rated by Consumer Reports with an solid “80” overall rating, which is the same rating as the popular Blendtec Designer 725. Consumer Reports is known for its rigorous blender tests and the Electrox Expressionist performed well in their smoothie and durability tests. It had moderate test ratings for crushing ice. It offers 900 watts of blending power and uses a tempered glass pitcher. My only reason for not including this blender as a pick for best glass blender is because the user reviews are very mixed. The Tribest DB950 is a 60oz capacity glass pitcher blender with a 820 watt(1.1 horsepower) motor that can achieve speeds of up to 23,000 rotations per minute. Tribest DB850 vs DB950: The two blender models look identical. The DB950 is an improved update to their DB-850 model. The DB-850 had problems with their plastic blade assembly breaking. The Tribest 950 model fixes that design flaw by using a metal blade assembly. So far the reviews on the newer 950 are better than the older 850 model but here was a good review that liked the 950 model but the motor broke on them . The other small complaint I saw was complaints about strong plastic smell despite using a glass pitcher. Overall, the Tribest Dynablend is about 2x the price of the Oster 1200 with similar power. The Dynablend DB-950 has good performance and I do like their 10-year warranty but wasn’t sure about the long term quality of the Tribest Dynablend DB 950 for the price. The Black and Decker BL1820SG-P glass blender Model from Black and Decker is actually close in price to the above Black and Decker model that I reviewed. This model has more power with 700watts. The reason it wasn’t included in the list is because the reviews were a little mixed. Consumer Reports said is did well in performance but Good Housekeeping said the Fusion Blade BL1820SG-P didn’t blend that well. As mentioned, many blenders have transitioned over to plastic jars as the power and speeds have increased, so the choices are limited if you want glass. The brands that I have listed above all have something to offer you in terms of performance and price. The Oster Pro 1200 is my top pick for performance and it is well priced. The Hamilton Beach is a more affordable option if you just want an inexpensive glass blender. How come you did not consider the Dynablend Clean in your comparison? Hi, does the oster pro withstand boiling water? Hello Carol, Yes it can but the boiling water can potentially reduce the life of the plastic base and the rubber o-ring. Also for boiling liquids on any blender remember to remove the center piece of the lid or use a blender that has a built-in lid vent (like Blendtec) to let the steam pressure escape. Hello Haroon, most blender companies use Tritan plastic for their jars because it has been tested the most to hold up to impact from high speed blenders. Here is the Tritan Safety information Tritan plastic is BPA free but I haven’t found decisive evidence that Tritan plastic being heated would cause any dangerous leeching. For smoothies you aren’t heating up contents so I wouldn’t been concerned with leaching. Waring stainless steel jar with a Vitamix blender is viable alternative. Thanks for the information on the plastic any information on any blenders regards chemical leaching from the motors and blades such as (Lead) the reason for asking the speeds of the blades would make heat to get a perfect result for your smoothie of left slightly longer. Any same information regards to glass blenders leaching or chemicals? Hello Haroon, I don’t know of any specific studies about glass blenders but I would talk to the blender manufacturer that for the blender you are interested in to see if they have any data. The manufacturers do a lot of safety testing but I don’t want to give you any certainty if you have a health condition that you are concerned about. I have a weak wrist. The oster pro is way too heavy.Do you recommend a lightweight glass one that is powerful for coconut milk? Also I tried to make fresh coconut milk in the blendtec and the plastic and milk got warm in it,Is that normally the case with plastic ones? And is this a concern health wise? Hello Olga, Most of the blender companies use Tritan BPA-Free Plastic as it has been tested the most for safety form the impact of blending. There has been a lot of discussion about whether the plastic leaches or not and so far it seems that Tritan plastic is safe. High Speed blenders like Vitamix and Blendtec are made to heat up ingredients into hot soups from friction just from blending so yes blending containers can get warm. If you blend long enough then you have to make sure to use a blender container has an exhaust to let the pressure release from the heat(which both Vitamix and Blendtec do). Just make sure to read the instructions for the specific brand of blender as they do have specifications on usage. Glass pitchers for blenders are typically heavier to meet the safety thickness so a “lightweight glass one” might only be for low powered blenders which might not be enough power for your needs. The other alternative is that people who don’t want plastic will use a Stainless Steel pitcher which I mention in the post above (and in the comments here). I don’t know of a Stainless Steel pitcher for Blendtec blenders though (I would ask them). I have to disagree with your assessment of the Oster Pro 1200 being unable to make nut butters or flours. I have owned and used the Oster Pro 1200 blender for just over 3 years and have made several different types of nut butters as well as ground wheat berries into flour. It does all of these things very, very well. I sold my Vitamix when I bought the Oster Pro as it can do everything my Vitamix could do. It may take a little bit longer but it can handle any task I throw at it. I hated the plastic blending jar of the Vitamix that not only picked up food odors but also became scratched and etched. It also was difficult to get a cold smoothie as it would heat up too quickly while blending, despite all of the ice and frozen fruit I added. Thank you Sue for taking the time to leave the helpful feedback on the Oster Pro 1200. Anna, which of these blenders are manufactured in the United States? Thanks. Hi Anne, Most blenders are made overseas but some of the manufacturing for Oster(Sunbeam) and Hamilton Beach are make in the USA. You would have to clarify with each company about each model. The blender companies that make design and manufacture everything in the USA are Blendtec and Vitamix which is why they are more expensive(but also last the longest) although neither Vitamix of Blendtec offers glass jars.